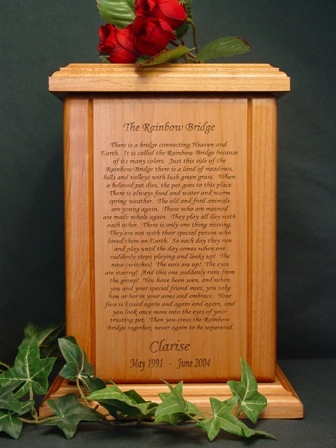 The Rainbow Bridge Memorial Poem Urn is made of Red Alder. This wood is a smooth surfaced wood and makes a beautiful background for the Poem. Your Fur Baby's Name as well as the Birth and Passing dates are engraved in the wood just under the poem. What Pet Urn Size Do I Need? Average shipping time for this item is 7 - 14 days.